Do you ever find yourself confused by some of the default names for metrics and dimensions in Google Analytics? Do you ever wish you could take a closer look at the specifics of how users behave on your site based on how they got there? No worries, you’re in good company on both counts. Google Analytics contains an array of hidden secrets that allow you to slice and dice data in unique ways to meet your needs. In this article, we’ll touch on the names of metrics and dimensions and show you a method to customize channels in a way that is tailored to different types of traffic and marketing efforts. 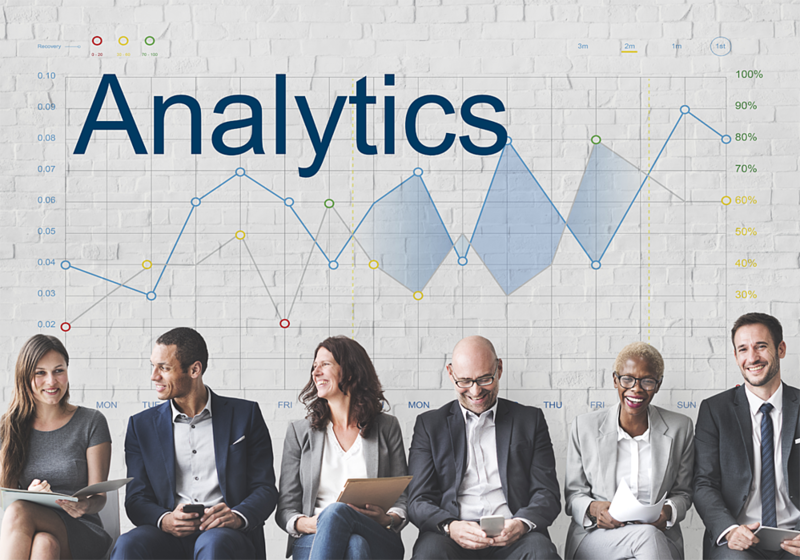 Before diving in further, let’s start by defining some key Google Analytics terms. Source indicates the origin of a visit, such as a domain (newyorker.com) or search engine (Google). Medium indicates the broad type of traffic, such as organic (from non-paid search), cpc (from paid search), or email. Channel indicates the higher level category of traffic defined by the combination of source and medium. For more details on how Google Analytics categorizes traffic into channels, see our previous post about Understanding Google Analytics Channels. In this article, we’ll delve further into customizing channel groupings to more accurately evaluate your data. Create a standard new “Channel Grouping” that defines how traffic falls into set buckets moving forward. In this case, previous traffic tagged with a source of “newsletter” and medium of “email” would stay the same, but future traffic tagged that way would fall into a “newsletter” channel. Create a “Custom Channel Grouping” that will apply channel definitions to all existing data, placing historical and future data into the right “bucket.” In this case, all traffic tagged “newsletter/email” would fall into the correct “newsletter” channel, including retroactive data. If you’re not overly familiar with the interface, we don’t recommend making major modifications to the Default Channel Grouping. If you’re not careful, you can miscategorize data permanently stored in your account. The best approach is to create a Custom Channel Grouping, which will avoid damaging the raw data coming into the account and give you the ability to see retroactive numbers. 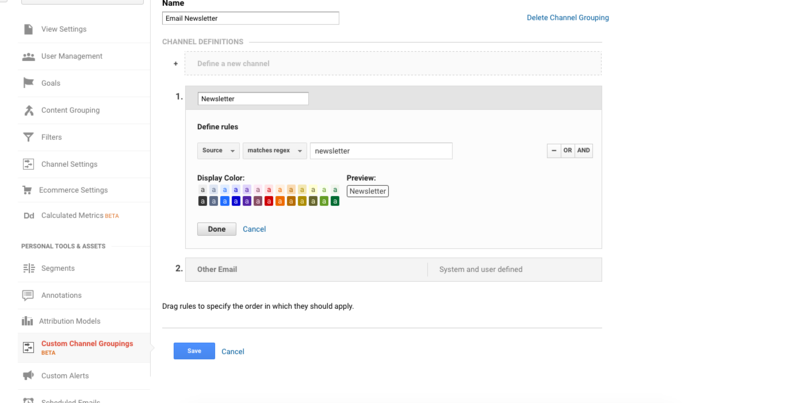 You can potentially create up to 100 Custom Channel Groupings under an Analytics view (vs. 50 for standard groupings). However, keep in mind that custom groupings are accessible only to the user who sets them up. 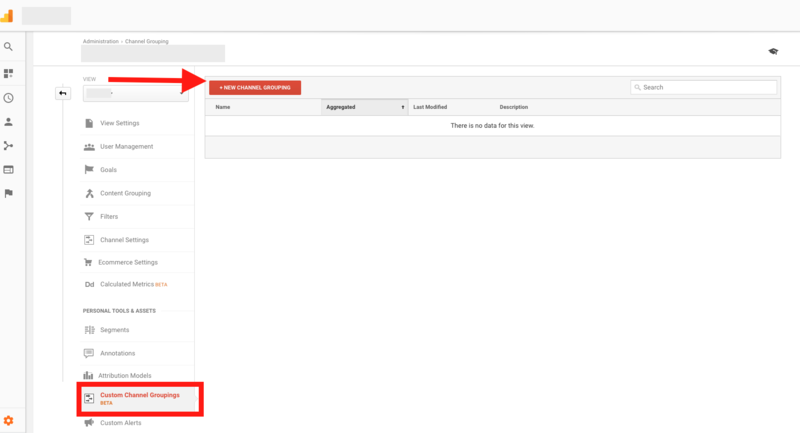 To start, access the Admin section of Analytics and go to Custom Channel Groupings under your desired view. Select the “New Channel Grouping” button. Next, begin defining the parameters you’d like in your channels. You’ll have to manually build any channels that should appear in the interface; any traffic not included will fall into an (Other) category. To learn more about creating URL parameters for trackable links, see our article on Consistent Tagging for Better Campaign Tracking. Next, we’ll build an “Other Email” channel that includes all email traffic except the newsletter. The first rule will include any traffic normally included in the default “Email” category. The second rule will include only traffic that doesn’t contain a “newsletter” tag. After saving these channels, we now have a basic Custom Channel Grouping to segment newsletter traffic from other email traffic. Going into the main Analytics reporting interface, we’ll navigate to Acquisition > All Traffic > Channels. From the dropdown to the lower left of the graph (right after the “Primary Dimension” text), we’ll select our new “Email Newsletter” grouping. Now, we can see traffic broken down by Email vs. Newsletter categories, with all non-email visits bucketed under (Other). We can now compare aggregated stats for how newsletter visits perform against other email visits. Interestingly, newsletter visitors actually spend less time on the site and look at fewer pages, this may be attributable to the fact that they’re often driven to select individual article links. Next, newsletter visitors are less apt to convert; however, this data is likely due to the fact that newsletter signups are in themselves a large portion of overall conversions. You can also use Custom Channel Groupings in the Multi-Channel Funnels reports, which allow you to see how multiple sources contributed to conversions. In the example above, we’ve applied our Email Newsletter grouping to the Assisted Conversions report, which counts sources that drove visits before a final visit from another source resulted in a conversion. For more insight on assisted conversions, see our extended post on how they work. We can see that the newsletter has played a role in assisted conversions vs. direct/last click conversions (where the conversion occurs immediately after the click from the source). In the next example, we’re looking at the Top Conversion Paths report, which shows the top combinations of channels in cases where 2 or more visits were involved before conversion. 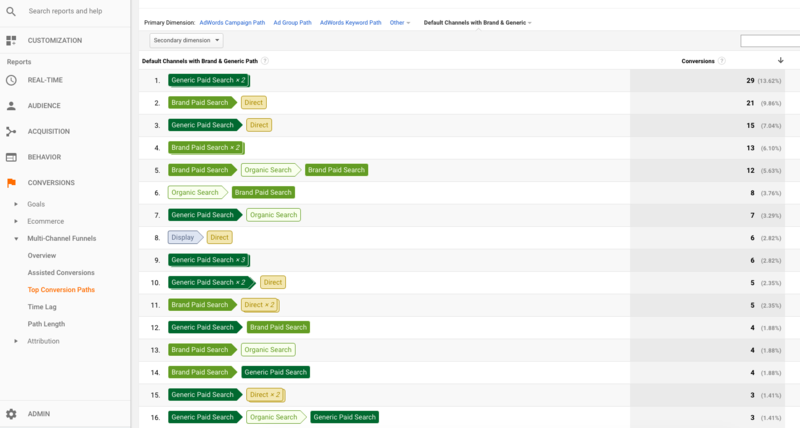 We’ve applied a grouping that includes branded and generic (non-branded) paid search terms. In this way, we’ve segmented out searches in which someone likely had a pre-existing knowledge of a company vs. those in which someone was searching for a service in general and saw an ad for the company. Based on this data, we can make several observations about how brand and generic searches differ. First of all, the top multiple-channel combos leading to conversion includes two generic searches. This information indicates that people are likely to search for a service more than once, maybe to compare companies or refine a search to become more specific, before finally submitting their information. Next, brand searches are more likely than generic to result in a later direct visit to the website that leads to conversion. Of course, people already familiar with a brand may be more likely to type in a URL directly once it’s saved in their browsers. Next, note some instances in which users searched a generic keyword first and then returned via brand terms to convert (or vice versa). This data indicates that the research process includes people who are visiting for the second or third (or greater) time. In turn, ad messaging and landing pages should account for returning visitors, using features like remarketing for search to tailor messaging more specifically to these people. Think about ways that Custom Channel Groupings can make your Analytics data more specific and allow you to analyze better segmented categories. For instance, you may want to break out paid social media traffic from standard social traffic (a default channel doesn’t exist for paid social) or divide organic traffic based on homepage visits (more likely to be brand) and inner page visits (more likely to be long-tail non-branded keywords). Remember, with Custom Channel Groupings, you won’t “break” any existing data, so have at it. Ask yourself questions that can be answered by more detailed data, then create your own groupings and experiment with how you can segment the data to produce new insights.